You'll be mesmerized by the incredible ocean views from this beautiful Hawaiian feel contemporary renovated in 2014. The open concept one-bedroom condo (701 sq. ft plus large lanai) is right on the beach in Waikiki and you’ll have a dazzling front row seat to the Friday Night Fireworks! - Sleeping area (no divider or wall between bedroom and living area) has a comfortable King bed. - FREE local calls and long distance calls to Canada and the U.S. mainland. Your condo is located in the newly revitalized area of Waikiki where you’re walking distance to great dining, shopping and entertainment. This non-smoking accommodation sleeps a maximum of 4. During our Holiday Season (12/20-1/4) there may be a 7 night minimum. Please check with our Reservation Department for details. 30+ night stays may include a discount (not available in all seasons)! I was very satisfied with the relaxing room"
"Sunsets on Waikiki from your private Lanai. This was a nicely appointed condo with plenty of room. The view from the Lanai of Waikiki Beach and the beautiful sunsets can not be beat." First time to Waikiki, the apartment was all we could hope for. A great view, very convenient for all the shops and restaurants and right on the beach. The place it self was very well outfitted, lovely big bed, lots of space, all the mod-cons! Fantastic." Nice upgrades however unit had dirty floors, dirty shower and mattress is due to be replaced." We have stayed many times at Waikiki Shores over the years. We, also, have stayed in different condos in Wakiki Shores over the years. We will continue to stay at Waikiki Shores for many years to come. We like everything about it. The office staff is wonderful. I enjoy communicating with them. They are very friendly and helpful. The property manager is excellent, too. " Waikiki Shore is in a great location. This unit is on a higher floor helping with views and noise. We did not use any kitchen appliances other than the refrigerator so I cannot comment on them. Air conditioner and TV worked great. Did not use washer but dryer worked fine. Shower, toilet, and bathroom sink/faucet all fine. Lots of storage for clothes. Lots of hangers. Lots of beach stuff (chairs, boogie boards, etc.) Owner seems to have thought of most everything one might need here. Parking spot was convenient. I would stay in this unit again." We have rented suites through you before in Waikiki Shore. Suite 1212 needs abit of Updating. The bed needs to be replaced, as does the bedding. The stove top needed a good cleaning. " First of all, I had got great ocean views from 12th floor lanai and had enjoyed friday night fireworks at Hilton. The property's condishon was very good.Especialy,parking was very useful and kitchen tools were very useful,too. Property manager,Paul was very helpful." We were met and escorted to our unit by Paul who was very friendly and happy. The unit was as it appeared in the photos. Coastal furnishings, a comfortable king size bed and excellent kitchen facilities. Plenty of crockery and cutlery. We were appreciative of ample supplies of detergent, washing powder etc. Didn't use the sofa bed. We found the air conditioning to be somewhat inadequate, but thatcould have been user error. Location was good for us, because we didn't mind the short walk to the main shopping area. We would definitely return to this unit.Thank you "
Wonderful apartment. So spacious and had everything we needed. Would definitely return Fab views from balcony of the sea and the city"
Comfortable, well equipped condo with a spectacular view. Loved the front row seat for the Hilton's Friday night fireworks. Property managers Paul and Byron were awesome! Very friendly and responsive. We'll be back!" can't find a better place. The unit was recent remodeled so it spaces and totally clean, it very homey. The full size washer and dryer are pluses." Very clean property with excellent view. Two comments, (1) Bed spring was too soft for me. I have had a pain in back when I woke up. (2) As I spent 10 nights this time, I wanted to have a bath tub." Thank you for Paul Kindness!! This room is fasionable, clean, a big mirror, a big closet, nice view and so on. I would recommend the room." We have stayed in a few places in Oahu in the past - all very nice but Waikiki Shore is definitely the best by far in terms of location especially since we did not rent a car on this occasion. It was so easy to walk to restaurants, shopping and beach, trolly stops near by, taxi/small store/ Starbucks available next door!! The condo was very clean, well maintained and everything was in working order. We got the same property manager, Paul, from the previous year who was fantastic and very helpful. I would recommend this condo to anyone without any hesitation and I very much look forward to going back to Waikiki Shore very soon! Mahalo, Paul and Denise, for your help!" 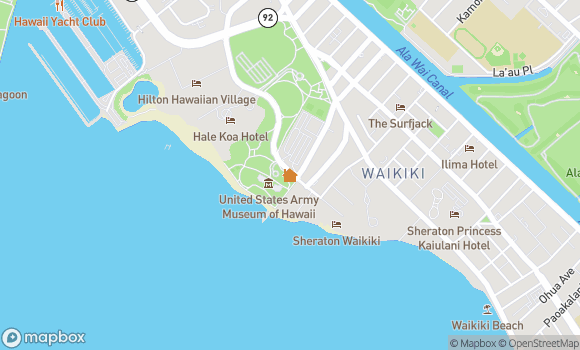 Great location with easy access to food, beach, and getting in and out of Waikiki with our rental car. Perfect view of the fireworks from the comfort of the balcony. Will definitely stay here for any return trips to Oahu." This rental is awesome! Great view to include fireworks Friday night. The location is perfect for walking around Waikiki and there is a Starbucks right next door that opens at 4am. Having full kitchen and washer and dryer in the unit helps save money on meals and allows you to pack less. You can either do tours or rent a car, parking spot include, and see so many sights from this location. Overall the unit is perfect. The king size bed was very comfortable and the kids said the fold out couch was also comfortable. The only thing, and it is minor, is the floor, all tile, needs to be deep cleaned. The bottom of our feet would get very dark/dirty from walking in the unit otherwise this would have been a 5 star too. The unit includes a boogie board, sand chairs, big beach towels and an umbrella for the beach. You can't go wrong with this place. Enjoy!" Beautiful view of beach, ocean and Diamond Head. Location is 5 stars, but interior of condo is not. Described as a one bedroom but, in fact, is a studio. Tired furniture, worn linens (sheets are pilled and had holes), pillows not clean, dishwasher broken, louvered window handle in bathroom broken. Pull out sofa bed mattress is awful! Completely collapsed in the middle, very uncomfortable. Had to put mattress on floor to sleep. Some basics missing in the kitchen – tongs, spatula – although we had about 5 bread knives and a box of Volcano bags from a previous guest (but no vaporizer to go with it). Ugh. Unit needs a complete refresh – new everything. Way too expensive for the overall quality of unit. Paul, the property rep, was arrogant, rude and opionated. Must be a graduate of Trump University. Opening conversation concerned our marital status and sexual orientation: “Oh, are you gay couples here to celebrate anniversary or wedding?” (?Really??) Later, he made a derogatory racial comment to our friend who had stopped in to visit. Overall unprofessional and unpleasant to deal with. This was our first trip to Hawaii. We were celebrating our 40th Wedding Anniversary. Our stay at Waikiki Shore #1212 made our week so enjoyable. From the time we met Paul when we checked in until we left a week later, we could not have asked for anything better. The condo is everything that is advertised and more. The view from the lanai is indescribable. We enjoyed the fireworks as well as some of the most beautiful sunsets from the lanai. As we had a car, the parking space was so valuable with the shortage of space in Waikiki. We found everything was in excellent working order. We would highly recommend Waikiki Shore #1212. " We have rented many times previous at Waikiki shore and this was the best condo we have stayed in"
Top Notch from Paul our concierge, to the condo and all its amenities and ease of use to the most spectacular view of Honolulu and Waikiki Beach!!!" Jan 29, 2016 - Karin S.
This was our second stay at the Waikiki Shore and it was better than the first. You cannot beat its location directly on the beach and within easy walking distance to everything in Waikiki. Condo #1212 is a beautifully renovated and well appointed condo. Everything is there that we needed, comfy king bed, all new kitchen and bath as well as washer/dryer, large screen tv. Paul from Captain Cook met us right on time to get us checked in and did a very thorough job going over the condo's amenities. Although only one building elevator was in service during our stay, we did not have to wait any length of time to use it. We utilized the building concierge Veronica twice to book a car and our snorkeling trip and she was very helpful. We finally visited Pearl Harbor and loved it. We also drove to the North Shore to see the big waves. Our favorite place for breakfast is always the Halekulani just two doors away. Their breakfast buffet is awesome and sitting on their beachfront patio is truly heavenly. Overall, we loved Unit 1212 at the Waikiki Shore and would definitely return someday. I wanna stay again !!!" Condo and location is beautiful"
We are a family of four and stayed for six evenings. The suite was very large for a studio and the location was unbeatable. Even though it was specified that it was recently renovated, I was taken back by the quality of materials used, it was very well done. The building is older but well maintained and having the convenient parking spot included was a real benefit. The large wall to wall windows to the lanai overlook the western portion of Waikiki beach and the marina and was perfect for the Friday night fireworks. The location is probably the best on Waikiki. Down the elevator and right on the beach or go the other way and there are a million restaurants and shops. The staff are all top notch and they all went well beyond expected to help make our vacation perfect. Special call out for Paul; super nice guy who really made us feel relaxed especially dealing with a little mishap which was our fault. My only complaint was the pull out bed was terribly uncomfortable and my daughter made a point of reminding us every morning. Overall, can’t beat the location and people, highly recommend. We could see a beautiful sunset from lanai, and enjoyed fireworks shows on Friday. The location was the great.We enjoyed the beach ,shopping ,and dinner everyday. Paul(property manager) was very kind and his Japanease was nice. We want to stay here again." We loved the unit!! Great location. Great view. Clean. Thank you Mr,Paul for helping our stay! we will be back next year!!" My wife and I thoroughly enjoyed our stay at Waikiki Shore 1212!! From the moment we arrived Paul was very informative, answered all our questions and gave us great information on the local area to include great restaurants!! We could not have asked for a better location. We were in a great location to walk to anything we wanted to do from swimming on the beach to first class restaurants in Waikiki, and there was a bus stop just a few feet from the entrance of the complex if we need to venture farther. Having our own assigned parking spot was amazing and saved on the huge daily parking fees at the local resorts. We also never had to worry about finding a parking spot when we returned from a busy day exploring the island. The balcony on the condo was fantastic and we enjoyed front row seats to the fireworks on Friday night. The condo complex has multiple elevators so we never had to wait long on a ride down or up. The washer and dryer in the condo was great and definitely allowed us to pack lighter for the trip. All other items in the condo worked and we had no issues with the place. Highly recommend. The park next door is fantastic and if you have a military id you can use the exchange in the Hole Kola which will save you huge on daily supplies, etc. The place is also stocked with the basics when you arrive. Toilet paper, paper towels, washing detergent, tissues, dish soap, etc. " We also saw Friday's fireworks from our room ,and,after the light rain was also seen double rainbow! This was our 8th time to Hawaii and this time we thought that we would try a self contained apartment rather a hotel room. The studio was very clean and it had all the amenities described. The photos are a true and accurate indication of what you can expect. Being on the 12th floor, it was away from the noise of the garbage trucks and delivery vans that operate in the early hours of the morning. The view was amazing and the beach is right at your door. It is a great apartment if you want to have a casual stay in Waikiki with a full kitchen to prepare meals plus the added bonus of a large washing machine and dryer. This offsets the cost of the room somewhat. The bed was comfortable although i am used to better quality linen, however the towels and beach towels provided were of good quality. The only drawback is the early morning light coming through the glass shutters in the kitchen which takes a few days to get used to. Check in was rather seamless from Captain Cook Resorts but be aware you cannot check in until at least 3pm and there is no storage facilities for your baggage as it is a privately rented condo. As our arrival time to Honolulu was at 6:30am, so unless you hire a vehicle to take in some shopping and attractions and therefore have somewhere to put your baggage, you will have wasted the good part of the day. Overall, a very good rental experience."